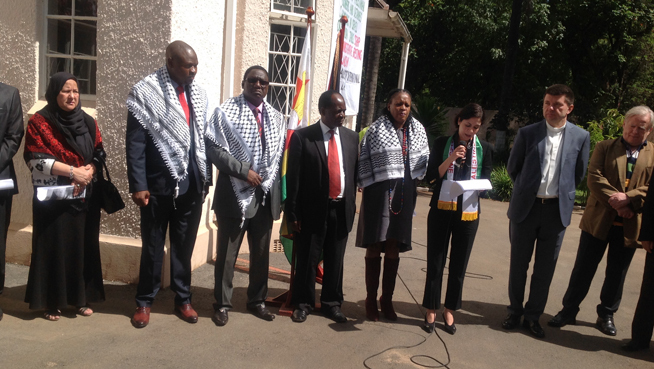 Zimbabwe’s parliamentarians, the Friends of Palestine, members of the diplomatic corps and civil society on Wednesday joined the Palestinian embassy for the “Solidarity Stand-off” being done by Palestinian prisoners who are on an open-ended hunger strike, protesting the inhuman conditions they are subjected to by Israeli prison authorities. Chairman of the Parliamentary Portfolio Committee on Foreign Affairs Cde Kindness Paradza and other committee members attended the event. The hunger strike is led by imprisoned parliamentarian Marwan Barghouthi and is “observed by 1 600 prisoners, to protest their deprivation of basic rights granted to them by international law and international human law”, said ambassador Senouar. She also read the full text of the “Freedom & Dignity” hunger strike letter written by Marwan Barghouthi “to his fellow parliamentarians around the world,” while Cde Paradza said the letter would be read in the Parliament of Zimbabwe. Barghouthi’s letter reads in part: “The hunger strike is a legitimate and peaceful means to protest the violations of our basic human rights as prisoners, as guaranteed under international law. Barghouthi’s sentiments were echoed by Foreign Affairs portfolio committee member Ms Priscilla Misihairabwi-Mushonga who told the gathering that their committee witnessed first hand, the ill-treatment against defenceless Palestinians when they visited Palestine last year. Turning to the plight of women and children under such conditions, Ms Misihairabwi-Mushonga said, ‘‘I also speak here not just as an MP, but as a woman because that is one of the voices missing in terms of advocacy around this issue. “What we found is that when you talk about prisoners, you’re talking about mothers being denied the right to motherhood . . . We’ve therefore committed ourselves as MPs in Zimbabwe to be the fore-runners and fore-bearers around the issue of Palestine, because we notice that in Africa, we have bought into the myth that the Palestinian issue is a religious issue. We noted that it certainly is not a religious issue. “Christians, Moslems and everyone else understand that this is a human rights issue; that it’s about a particular nation that has decided to use its power and might to usurp the rights of people, and it will ignore international conventions. “It’s time that we in Africa – because we understand the system of colonialism – we should therefore understand the pain the people of Palestine are going through,” she added. Ms Misihairabwi-Mushonga also gave insight into the advocacy programmes already underway: “We have decided that as parliamentarians, this is one area we are going to take on and create advocacy. We started doing it within the Sadc forum; we have done it at the African Union and the Pan African Parliament. In Sadc, we are setting up a committee to work on the Palestinian issue,” she said. Friends of Palestine representative Mr Robson, M Musarafu said that the continued demands to the United Nations and AU by President Mugabe “for a Palestinian state is an indication of Zimbabwe’s steadfast position against the Israeli occupation of the Palestinian people . . . A two-state solution is the minimum solution this conflict requires,” he said. In February 2016, National Assembly Speaker Advocate Jacob Mudenda led a parliamentary delegation to an international conference that was held in solidarity with Palestine in Iran. Adv Mudenda affirmed the strong ties between Zimbabwe and Palestine. “The relationship between the people of Palestine and the people of Zimbabwe is deeply and firmly rooted in our comradeship forged in our common independence and sovereignty, driven by the humanitarian motive force against oppression and ethnic supremacist,misdirected political ideology,” said Adv Mudenda.